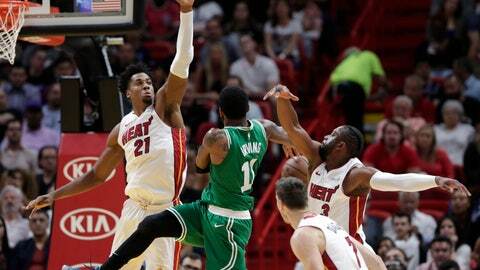 Celtics: Boston, which jumped out to a 17-2 lead over Miami on Monday, started this game on a 9-0 run. … Jaylen Brown missed his second consecutive game with back spasms, and Marcus Morris was out with a sore left knee. … Irving has now played in 11 games at Miami; his Cleveland teams went 0-7 on the Heat home floor, and his Celtics teams are now 2-2. Heat: Justise Winslow (thigh, nine games missed) and Rodney McGruder (knee, eight games) returned from injuries. … Miami has now used 26 starting lineups this season. … Heat legend Chris Bosh sat courtside.